Harry Berzack is a collector of 19th-century and pre-World War II sewing machines. Unlike many collectors in this field, Harry’s 500-piece collection is international in scope. Recently we spoke with Harry about his collection of antique sewing machines, the history of sewing machines, their uses, and the four major manufacturers. We also discussed toy sewing machines made for children. I work for a sewing machine distribution company that was started by my late father. 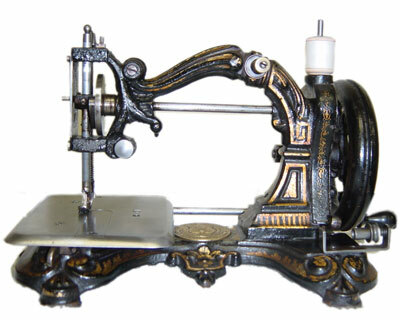 We mainly distribute industrial sewing machines. At a very early age, I became interested in sewing machines in a general sense, and I started collecting old machines mainly to see the technology and how it had developed. Then I immigrated to the States—I’m originally from South Africa—and my new life caused about a 20-year hiatus in which I did very little with sewing machines, although the passion never left. Then about eight years ago, I started to have a little more time and I started to get back into it. Now it’s grown to the point where today I have one of the largest and best collections in the States. We have a museum at our business where I house my collection. We’ve taken a section of our premises here to create a full museum environment where the machines are on display. I have almost 500 sewing machines in my collection. Initially I brought some machines with me from South Africa, and I picked up one or two here and there over the next few years, but most of the machines—probably 450-plus of them—have been acquired over the last eight years. Collectors Weekly: Do you have sewing machines from all over the world? Berzack: Yes. That makes my collection a little different from most. Probably the best collection in the States is owned by a person named Carter Bays. 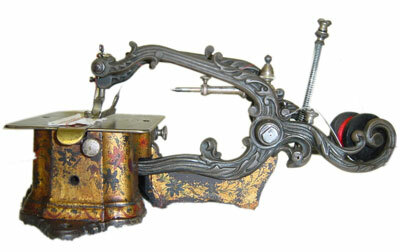 Carter only collects American machines, and he has authored the standard book on antique American sewing machines. On the other hand, I have machines from America, Canada, England, France, Germany, Sweden, and Denmark, so my collection is more a worldwide but it also shows cross-influences. I decided to collect from across the world intentionally. I just had a wide interest. There’s a great museum in England, but most of the machines there are British. The German museums are a little more mixed. There are probably 10 very good museum collections around the world. I’m more drawn to the ideas in the machines than the country that made them. I’m drawn to rarity. I’m drawn to condition. I’m drawn to mechanical design and how people thought up different features. Some machines survive to this day and some were inherently no good to start with. It’s a passion of mine to see the way people thought, going back to the 1800s, and the sort of engineering they devised. They didn’t have the machine tools we have today, and yet they did some incredible work. The earliest machines probably come from the 1840s and they’re very rare. Then you get into the 1850s, and the big names were Singer, Wheeler & Wilson, Grover & Baker, Howe—just a myriad. There were literally hundreds of people who made machines in different countries. Very few of the manufacturers have survived, and that in itself is part of the story. The small companies were gobbled up by Singer and others. Of course, Singer is still around today and the name is still known. The Jones Company was bought by Brother, and I don’t think they use the Jones name anymore. It was evolution. It was competition. It’s the old story: Someone’s making sewing machines and other people think they’re making a lot of money, so they say, “Why shouldn’t I?” At that time it was a comparatively easy industry to get into. Sometimes the ideas they had were not that good. Other times they ran into patent infringement problems and they were put out of business. Strangely enough, this was happening all over the world. In America, there was a demand for household machines and a demand for commercial machines. The same sort of thing happened in Britain. With American machines, you had machines for home use, mainly with treadles because homes were bigger. In Europe, people didn’t have as much room, so most of the machines were hand cranks, which made them more portable. 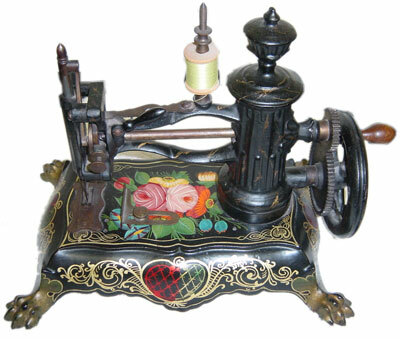 A sewing machine typically has a wheel on the side that’s used to position the needle and operate the machine. A hand crank is a handle that is attached to that wheel. Of course, in the commercial arena, it was all treadle and, later on, line shaft. Collectors Weekly: So the hand cranks were used when there wasn’t as much space? Berzack: It’s certainly difficult to make a general rule. Some people just didn’t want a treadle cluttering up the room. They wanted something they could push in a corner or put in the bottom of a cupboard and take out when they needed it. Other people by necessity didn’t have the room to put in a treadle or a cabinet. To a lot of people, the sewing machine became a status symbol, so a lot of the cabinets are extremely ornate. Today, it’s very often that the more ornate the cabinet, the better the condition of the machine because they were show pieces. They weren’t used. A machine that was really used a lot may sell for $5, and then at the top of the market, you’d have the same machine encrusted with mother of pearl. By and large, those machines are in great condition today because no one wants to use them. For a while, a sewing machine in the home was a status symbol. A husband would decide that his wife needed a machine, so he’d go out and buy a lovely machine. The sewing machines combined great design with pure utility. In America, the four majors were Singer, Howe, Wheeler & Wilson, and Grover & Baker. They basically held all the patents, and they were always suing their competitors for patent infringement. They formed a consortium and pooled all their patents and a royalty was paid to this consortium for every machine made, including by themselves. They had some formula where they divvied up the proceeds each year. They had no hesitation in closing down other companies on patent infringement, so a lot of people sought to do things a different way to overcome the patents. For example, there were machines where the needle, instead of coming from the top down, was linked to the bottom and came up through the plate of the machine like an upside-down machine. Collectors Weekly: What were some of the earliest designs that were being manufactured? Berzack: It evolved very early into the form you have today—a base, an arm, the top coming across to hold the needle, and a drive from the underneath with either a bobbin or a shuttle. Those were all pretty early. There were circular-shaped machines, open latticework machines—it’s difficult to explain without having pictures or really working with it. There are a number of pretty good books, but unfortunately most of them are out of print. There are current books, like Carter Bays’ book or Charles Law’s, that are still in print. Last year, Carter Bays came out with a third edition. A lot of the early books are out of print, but they do come up on eBay. Then there’s another whole subset, and that’s toy sewing machines. As the mother used to sew, the daughter used to have a little toy machine to make garments for her dolls. Those machines are mainly German by two big companies and a number of smaller companies. There were some British companies like Vulcan, too. It’s a completely different interest, although I’ve got a small toy collection. It’s more the premium toys, though, because those are the more interesting ones to me. I have one toy machine from France from around 1867. I think that’s my earliest toy machine. The real way for anyone to really get into this is to look at some of the collections. There’s the International Sewing Machine Collectors’ Society, which is ISMACS. Anyone in America who has any real interest in sewing machines should come to the convention in Charlotte, North Carolina. My collection will be part of the convention’s itinerary. Anyone who comes through my place will get a guided tour. We’re expecting a couple of hundred people and they’ll be able to see machines that they otherwise would never see. For example, there’s an American machine called the Manhattan, and there are only two known Manhattans that have survived. I have one, and Carter Bays has the other. 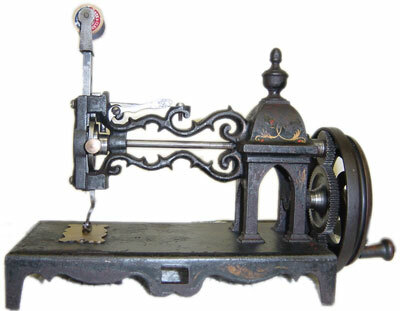 It was made by a New York company that called themselves Manhattan Sewing Machine Company. They made very few machines, probably less than 2,000, and then they disappeared. Collectors Weekly: What are some of the other known rare machines? Berzack: There are a number of machines in Carter Bays’ collection that are the only known examples, but you always have to be careful saying that because you never know when another one’s going to come up. For example, I had a machine that was the only known example and now there are three. I have two and Carter has one. So there are machines out there and eventually you’re going to find them. Everyone wants the rare machine. Two weeks ago, I drove 2,300 miles because I found a machine just outside Kansas City and the only other known example of that machine is in the Smithsonian. So now I’ve got the second known one, but until this one appeared, no one knew that it even existed. To anyone who’s getting serious in toy machines, a good introduction would be the two volumes put out by Glenda Thomas. For American machines there’s Carter Bays’ book, The Encyclopedia of Early American Sewing Machines. It has illustrations and a bit of background on the companies: what they made, who they were, and when they were in business. Then, if you get more interested, you should join ISMACS. They publish a magazine that comes out every three months or so. They’re the biggest sewing machine club by far. There are two others. There’s a website that’s based in England with a good gallery of machines but it’s more for quilters, and there’s a good website called Dincum.com. He’s a very good friend of mine. Collectors Weekly: Do you collect modern machines or do you stop at a specific time period? Berzack: The latest machines I have are from the 1940s. One of them is from the Second World War. Singer came out with a surgical sewing machine used in the field to stitch wounds. There aren’t many of them around, so that’s worthwhile. Another machine I have from the ’40s is still in its original packing case with the label on it where it was railed to a customer in Munster, Indiana. But I would say that probably 90 percent of my machines predate 1900. Collectors Weekly: Were sewing machines first used in the home? Berzack: Actually, no. There’s no one inventor of the machine. Different people had different ideas. There was a Frenchman whose first machines went into a factory in Paris—the workers were so upset because they thought that they were going to lose jobs. So the earliest machines were really designed for factories, but it very soon became a household thing. A lot of the companies didn’t necessarily market under their own name. The department stores had departments selling sewing machines. Sears Roebuck had machines with decals with their name on it. Those machines could’ve been made by one of three or four different factories, and if you’re really into it, you can work out, “Well, this sewing machine was made for Montgomery Ward and this was made for Macy’s.” There are giveaways as to who the actual maker was but there are thousands of names out there. Collectors Weekly: How did Singer become so well-known? Berzack: Because of marketing, not invention. They were not great innovators, but they were unbelievable marketers. They bought people out. If you’re making a million machines a year and you have a factory in the States and a factory in England and you control your own distribution, you get into a very strong position and it’s not easy for people to fight you or dislodge you. A lot of people copied them. The classic Singer machine in the early days, the mass-market machine, was the Singer Model 12, and there were literally hundreds of people who knocked it off in one way or another. There was a tremendous amount of copying. There was some licensing, but most of it was illegal copying. In fact, there were even people who copied the Singer emblem, the “S” emblem. People tried to jump on the bandwagon. Singer owned its own companies all over the world. They have never badged a machine, which is putting someone else’s name on, and they control their own distribution. They have their own subsidiary companies and factories in probably 20 to 30 countries, like Italy, Brazil, Scotland, Australia, South Africa, Taiwan. They had a big presence in Russia, too, prior to the revolution.You can take out an atlas and wherever your finger falls, Singer probably had a factory there. Collectors Weekly: How did the machine evolve from the 1800s to the 1900s? The next thing was, as I said, the shuttle moving through the loop. You had what was called a round bobbin, which is basically the way lock stitches form today. The earliest bobbins were Wheeler & Wilson and that goes back to the 1860s. Today you don’t have shuttles at all because everything is either bobbin or loop or chain-stitch machines. Collectors Weekly: How many different parts are there to a sewing machine? Berzack: That’s like asking how long is a road. There are some very simple machines that aren’t very effective and don’t have many parts. A modern industrial sewing machine could have 1,500 to 2,000 parts in it, but you could also find a machine with 20 parts. They’re not very effective, but they exist. 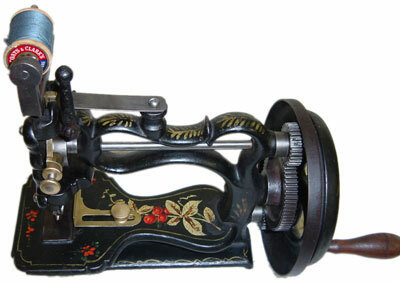 In the early machines, which were invariably made out of cast iron, one turn of the handle gave you one stitch. One of the first innovations was to gear it so that one turn of the handle gave you two stitches so you’d get double the production. Today you have diecast, aluminum, and plastic machines that are capable of doing 9,000 stitches a minute. Collectors Weekly: Are repair parts still available for older machines? Berzack: No. People who are really into it have to know a little engineering and make their own parts. If you use an antique machine, then you’re basically using one of the mass-produced machines and their parts are easier to find. Singer made a million machines a year of the class 12, so they probably made about 10 million machines total and there could well be half a million of them that are still running. It’s comparatively easy to pick up an old machine for parts to adapt or modify. But the very old stuff? If you’re missing something, that’s it. Collectors Weekly: When you collect sewing machines, are there specific things you look for? Berzack: I look for rarity, condition, technical differences, and what would have been an innovation at the time. I try to fill holes in my collection with rarer machines. There are rare machines that come up every now and again on eBay. Sometimes I get them and sometimes someone’s more generous than I am. It’s very difficult today to find machines in antique shops or flea markets. Odd ones still pitch up but not as much as they used to. A lot of the antique shops have no idea how to value these things. Say there was a Singer that was patented in 1860. Because it’s old, it would be marked at, say, 300 bucks, but the value of it is probably closer to $25 because Singer made half a million of them that year so they’re not rare. They assume that because it’s old, it must be valuable. Every sewing machine collector I know has a machine that they overpaid for and a machine that they’re sorry they sold. As soon as you go beyond the basic machines from the 1900s, what are called the quilters’ machines, you have to start educating yourself or you’re going to hit the poor house before you know where it is, and you’ll have nothing to show for it. Anyone who doesn’t come to the shows is going to miss a great opportunity to educate themselves. Collectors Weekly: Is it possible to find the actual patents? Berzack: There’s a lot of patent information out there. Some people collect a lot of the paperwork. You can’t collect everything, though. Some sewing machine collectors also collect oil bottles. Some collect old needles. I’ve got a pretty good collection of oil bottles. I probably have around 150. “ ” I heard that a band called Big Brother and the Holding Company was playing at a place on Fillmore, so I went.